I talked up the F’ing Monkey’s holiday, All Swines’s Day before it actually happened but I still wanted to give one more mention now that everyone’s arteries have started moving again. A quick recap, All Swine’s Day takes place on the first Sunday of the New Year. The above picture was one of the shots I took before I really started cooking. When making the bacon weaves I cut off about two inches from the bacon. 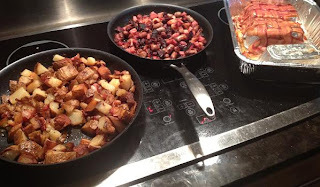 This bacon tips are stockpiled in a bowl and used when cooking the other pork and in the potatoes. I didn’t take a picture of the scrambled eggs or all of the burrito fixings (cheese, sour creme, etc). The closest pan is potatoes and bacon. 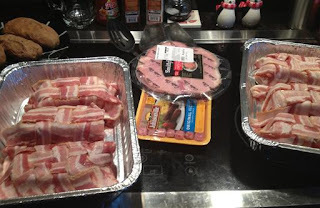 The other pan is a mixture of diced ham, bacon, and sausage. The recommend way for eating the All Swine’ Day breakfast burrito is starting with a flour tortilla, then the bacon weave, then adding everything else.